From July 4-8, 50 participants coming from different sectors and nationalities visited Acre to look at how the NGP concept can support sustainable, low-carbon development in Acre, and what we can learn from each other. The tour was co-hosted by the state government of Acre and WWF Brazil. The challenge for Acre is to ensure the forest is worth more standing than chopped down. Along with partners including WWF, the government is running various initiatives to add value to the forest-based economy. For example, government policies encourage sustainable land uses and livelihoods compatible with forest conservation, such as growing fruit and vegetables, fishing, and farming fish and poultry. The Acre state government has been participating in the NGP platform since 2012. It sees well-managed plantations as a promising sector for building the state’s green economy. These include plantations of rubber trees, other native species such as acai palms, and non-native species including eucalyptus for timber. The first day of any New Generation Plantations study tour can be a culture shock. Our hosts have to accommodate over 40 people arriving from 11 countries, speaking a variety of languages. Many of us have endured multiple long-haul flights to reach Acre. And while about a third of the people here have been on NGP study tours before, the fully participative approach is often a surprise for those who haven’t. Today is about setting the week in context and in particular hearing from the representatives of the Acre state government. Acre only became a state in 1962, but for the last 20 years it’s been a world leader in green development. The government’s mission is to retain as much of its forest as possible, while promoting development and improvement in social conditions. In climate change vocabulary it is trying to de-couple development from carbon emissions. Some of the numbers in Acre are striking, with 40% of the population living below the poverty line and GDP per capita at 60% of the national average. But the numbers are going in the right direction. GDP in Acre has been growing at 6% per year, faster than the national average. Today, 86% of the population is now connected to piped water, compared to just 36% in 2000, while 91% have access to mains electricity and 92% of children aged 9-14 are in school. At the same time, the deforestation rate has fallen by 55% – even though the number of cattle (the leading driver of deforestation in the Amazon) has tripled since 1999. Protected areas now cover half the state, which still retains 87% of its forest. A key step in this process has been clear leadership from the current and several previous state governors. This is supported by an obsession with valuing environmental services, and measuring, monitoring and verifying them. The mantra of “if it matters, it’s measured, and if it’s measured then it’s managed” is as true for carbon stocks in the forest as it is for biodiversity, soil health and water. Professor Edgar de Deus, representing the state government, highlights that while agri-business is important, it’s not always great for jobs , particularly when the dominant enterprise is extensive cattle ranching. Instead, the state of Acre has focused strongly on agroforestry, mixed plantations and carbon financing as a means to restore and protect rainforest areas. This choice appears to be working for the people of Acre. And if the government of this state has found a business model that enables development while reducing both emissions and deforestation, then everyone will benefit. Join our online plantation community and share your thougts with us. JULY 5 - LIVING OFF THE LAND? We meet Paulo Sergio at his wooden farmhouse, in the heat of early afternoon. It’s a relief to sit in the shade of his porch and drink some cold water. Paulo has farmed cattle for many years as well as managing a rubber plantation on his land. His ambition? To make enough money for his children to go to college, so they have more options than just working on the farm like him. Making a living from the land isn’t easy in Acre. We hear from several small farmers that the biggest challenge is access to the main markets in Brazil, which are many hundreds of kilometres to the east. Many farmers are diversifying from cattle to a wider range of crops like rubber, bananas and cocoa, which are planted on the poor quality grazing land. The government plays a huge role in Acre, supporting local farmers through various initiatives and investing in local towns. But it seems unclear how sustainable this is without a significant market for the main commodities produced. Most NGP study tours are hosted by a company that has significant investments in the area – a large pulp or paper mill, timber sawmill or bioenergy facility. It’s this investment that drives the planting of trees or crops, usually by a combination of both the company and local farmers. Without a significant end market, the farmers and landowners seem overly reliant on the government to support them. Paulo would like the government to offer him a guaranteed price for his rubber, and thinks this would encourage more small farmers to produce rubber. A local government-run condom factory is the main local purchaser of rubber, but they prefer to buy “wild rubber” harvested from trees within the forest rather than plantations. 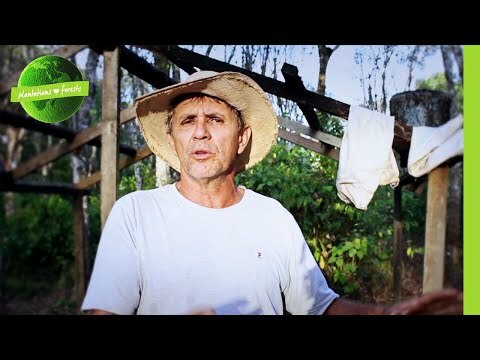 How can people like Paulo increase the value of the products they grow on their land? How can they access distant national and international markets? And what options can his children look forward to? These are some of the questions we’ll be discussing. If you’re interested in the Amazon rainforest, you’ve probably heard of Chico Mendes. 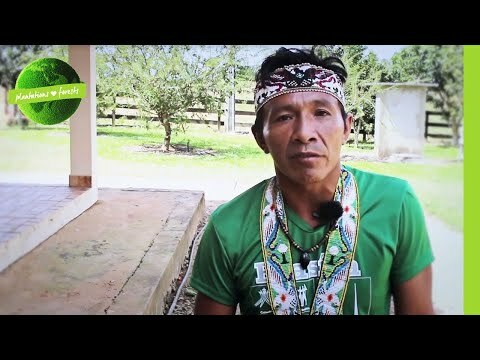 A rubber tapper born and raised in the forest in Acre, Chico became an environmental and social campaigner who brought the plight of the Amazon to global attention – before being murdered by cattle ranchers in 1988. It’s a huge privilege to spend today with his cousin, Nilson Mendes – a man who shares his knowledge, passion and enthusiasm for the forest. 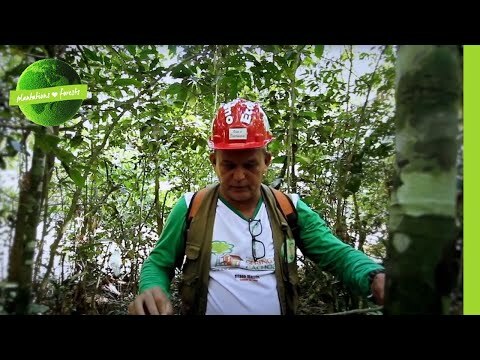 Nilson works as a forest guide for an eco-tourism project, Pousada Cachoeira. And he’s also restored a rainforest on his own property. We often think of deforestation as a one-way process. New roads drive an increase in logging and charcoal production, cattle ranchers clear the area with fire, and in the space of a generation or two forest has become field. Sat on the balcony of Nilson’s house, surrounded by trees, family and a few chickens, I’m astonished to learn that 15 years ago this had all been open fields. 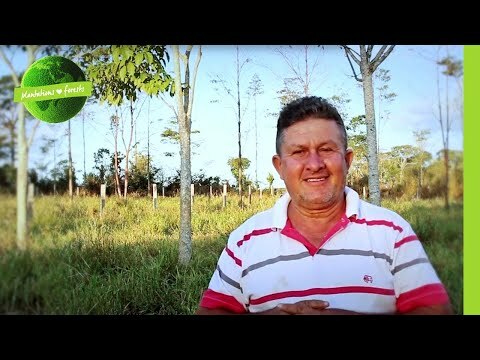 Nilson has planted up his 130 hectares with a huge range of trees, including 50 species of fruit trees, to recreate a productive forest environment. Instead of ranching cattle, Nilson is able to make a living for his family from the produce of the trees he grows, with chickens and some feral pigs enjoying any over-ripe fallen fruit. While some of the smallholder plantations we’ve seen are relatively intensively managed with just a handful of species, this place feels like a forest. Is this an alternative model for communities living on the perimeter of the forest? Can people make a living by keeping the forest standing and managing the trees, rather than clearing them? And what role can carbon finance play in supporting this? Chico Mendes believed that keeping the forest standing was a better way forward than clearing it for cattle. It’s inspiring to see his cousin – and many others in Acre – showing that it’s possible. You can read more on Chico Mendes via our online plantation community. One of NGP’s four principles is that plantations should “be developed through effective stakeholder involvement processes”. Developing partnerships and working with local communities is key to this. On a previous study tour to Brazil, we learnt how Fibria resolved a major timber theft problem by investing in community relationships and community-led projects. It’s important for any company or organisation to take the time to understand the complexity of different communities and peoples. In Acre, for example, it’s not enough simply to categorise communities as indigenous or settlers. Earlier in the week, Anna Lousia, who works with a local NGO representing indigenous groups in the Amazon basin, explained that there are 14 distinct indigenous peoples in Acre, including four who live in voluntary isolation near the remote Peruvian border. Each of these peoples has different cultures, tradition and aspirations. Settler is also too broad a term: the “Seringueiros” who were encouraged to move to Acre during World War Two to harvest wild rubber are hugely different from the rubber farmers, and particularly the cattle ranchers who threatened their existence during the 1980s. And, of course, there are often differences of opinion within all of these groups. The bottom line is that if you launch any policy, programme or project that affects people’s lives without taking the trouble to understand and engage with them, you’ll have problems. There’s justified criticism that programmes such as REDD+ and large-scale plantations projects have sometimes been imposed on local communities and, especially, indigenous peoples. Even when the intentions are good, they may not have the capacity to engage in complex, time-bound consultation processes. And communities who have traditionally been ignored or marginalised can be particularly difficult to engage, precisely because they have been ignored in the past, and need to be convinced that things have really changed. In Chile, a Mapuche tribal elder told me that “the forest companies have been here for 70 years, but they have only just noticed that they have neighbours”. The best place to start is through open dialogue and really listening – and NGP provides a space for that. It’s a place where Skip, who works for one of the biggest paper tissue companies in the world, can chat with Poá of the Katukina people on the same tour bus. Where people from local and international NGOs and corporations can have conversations with rubber tappers, conservationists, indigenous peoples, cattle ranchers and fish farmers. For real social partnerships to develop, we need to move beyond pre-conceived conceptions of what people or organisations want, and actually learn to listen. That builds understanding, empathy, and the chance to co-create solutions. Only then will we be able to move forwards. We visited Acre in the dry season, as it makes moving around in the forest much easier. But as several farmers commented, and we could see from the landscape around us, this dry season has been particularly severe – and the drought could continue for several months. As elsewhere in the world, previously reliable patterns of weather are becoming less so. 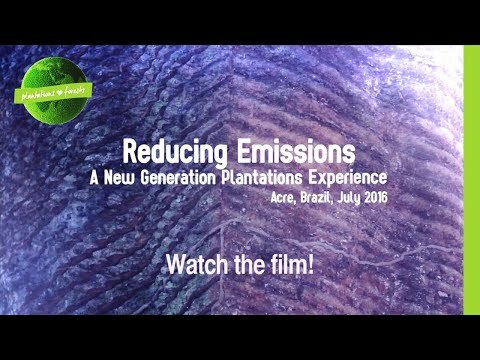 This week we’ve seen how people in Acre are attempting both to mitigate climate change through reducing emissions from forest loss, and to adapt to its impacts. All the farmers we’ve visited are diversifying their businesses, to make their farms more environmentally and economically resilient. José De Faria has made a huge investment in 30 hectares of aquaculture ponds and is exporting five species of fish all over Brazil, while also experimenting with acai plantations. Joao Paraná has expanded a 37 hectare farm growing only corn to 312 hectares, adding cattle, rubber, coffee, bananas and other fruit trees. On Joao’s farm, we also saw one of a number of agro-forestry research trials taking place in the state. The basic idea is to plant trees within the pasture to improve soil fertility and provide shade for the grazing cattle. Trials here and in other parts of Brazil show that this can improve yields for cattle farmers, while also helping to store carbon and potentially providing a source of timber in the same area. Cattle ranching has been the primary cause of deforestation in the Amazon, but vast areas of pasture are now degraded, barely able to support a single cow per hectare. The diversified models we’ve seen this week can help bring these lands back into productive use, boosting jobs, income and resilience, while also enabling forest restoration and carbon sequestration. The results seem so apparent, so my main question is: why isn’t everyone doing this? Lack of awareness and lack of capacity seem to be the main challenges – but those are obstacles that can be overcome, and the Acre state government seems to be doing its best to provide support. It’s been a tremendous week, and I’d like to thank our hosts from the local WWF office in Rio Branco for looking after us so well, and all the smallholders and farmers we visited. Hopefully we can return in a few years to see how things have developed.